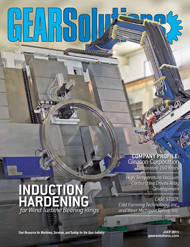 As installed capacity and component size continue to grow in the wind sector, induction hardening is a cost-and time-efficient method to meeting demand. 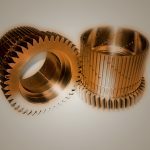 As demand for gear rings and bearings increases, so will the need for more sophisticated induction hardening solutions. It seems nothing — not even a worldwide financial crisis — can stop the rise of wind energy. The 2008-12 global recession did slow the sector’s growth — to the extent that 2013 resulted in the wind industry’s first-ever contraction (in terms of added capacity). But as figures from the Global Wind Energy Council (GWEC) show, wind energy is back in a big way. So far, so good. But how can companies in the gear, heat-processing and related industries win a slice of this burgeoning market? One approach is to harness the advantages of induction heating as a hardening method. Take large bearing rings, for example. Such rings must obviously be hardened in order to increase hardness and improve wear resistance. But there are major drawbacks with the case hardening and through-hardening methods still widely used today. The former, case hardening, involves a carburizing process that can take hours — even days — to complete. Then comes quenching , typically in a brine or oil bath (hardly an environmentally sensitive procedure), followed by hydrogen expulsion. The part is then subjected to yet another production stage — annealing in a separate oven. Through-hardening with ovens follows a similar process, except the outcome is a part that is hardened through its entire cross-section. There is one major disadvantage accompanying both traditional case and through-hardening — excessive heating times. This not only increases labor and energy-consumption costs, but also results in distortion, which in turn leads to subsequent re-working costs. 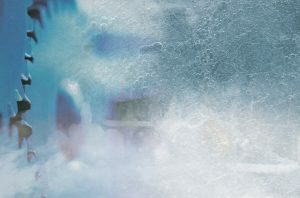 Induction hardening, however, can go a long way toward minimizing or even eliminating these problems, primarily because of the method’s extremely quick heating times. This results in energy-consumption cost savings and reduced overall process times. 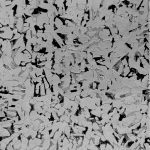 Induction hardening practices also facilitate integration of the hardening process into the overall production flow, thus eliminating the time and costs associated with moving parts off site or extracting them from the line. The process also keeps re-working costs low, due to the ability of induction heating’s fast heating cycles to minimize distortion. • Step 1 — Two coils (on the right of the ring in the diagram) heat the start-zone. Once the desired temperature is reached, quenching of the start-zone begins. The coils then move around the ring, heating it. • Step 2 — A stationary coil begins pre-heating the end-zone (on the left in the diagram). The two scanning coils advance towards the end-zone, heating the ring along the way. • Step 3 — The stationary coil moves away as the two coils approach the end-zone. • Step 4 — The two coils move away once the desired temperature has been reached in the end-zone, and quenching begins. 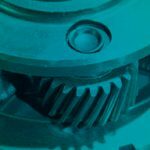 Such “seamless” hardening is a proven and highly successful hardening method for even the largest rotary bearings. But it does call for sophisticated control software, advanced coil engineering, and strict adherence to numerous procedural parameters. 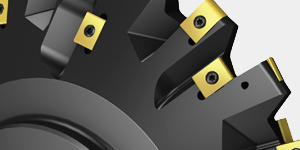 The third category of inductive surface hardening for rings is ‘single-shot’ hardening. As the name suggests, this method involves heating the entire ring with a single pulse of energy applied via a single coil. 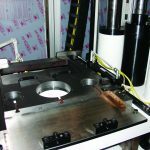 Single-shot inductive surface hardening is however limited to rings with a maximum diameter of 2,000mm. 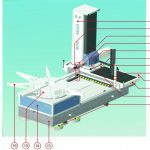 Anything above this size is not economically viable with currently available technology because of the dimensions and complexity of the power converters, handling equipment, and quench systems required. 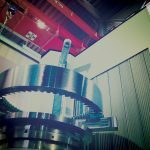 On the positive side, single-shot hardening is an optimum method for the large gears used in wind turbines. 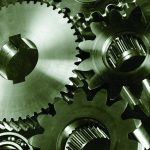 Inductive gear hardening can be grouped into three processes: tooth-by-tooth (also known as “tip-by-tip”), gap-by-gap, and spinning. 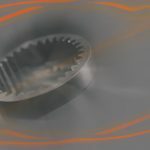 However, induction heating of wind turbine gears typically involves the first two processes, as they are better suited for such gears’ large modules (greater than 4mm). Module size is one of the most critical parameters in induction hardening in that it determines the power rating of the induction heater and the frequency employed. The basic rule is that frequency decreases with increasing module size. 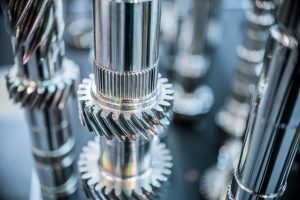 Tooth-by-tooth induction hardening is typically used for less highly loaded gears. 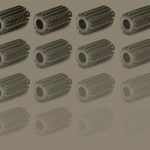 Depending on the metal used, tooth-by-tooth inductive hardening delivers approximately 80–100 percent of the roller hardness achieved by case hardening. But there are issues with the process. 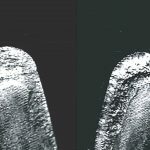 End-edge effects brought about by the interaction of eddy currents and tooth profiles can result in a tooth base permanent hardness that is 20 percent lower than that achieved by through-hardening. Another issue is that of thermal conduction. This is a particular concern when heating tips and flanks, as the small mass of metal in these areas facilitates easy heat transfer. 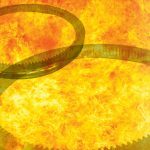 The fear is that transferred heat will cause “tempering back” — softening parts of the gear that have already been heated. The risk of tempering back is obviously larger when hardening small- and medium-sized teeth. 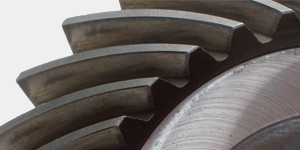 When hardening larger teeth, the metal mass at the core of the gear acts as a heat sink. Gap-by-gap induction heating eliminates the problem of the end-edge phenomenon, as the complete tooth gap is hardened as a contour. 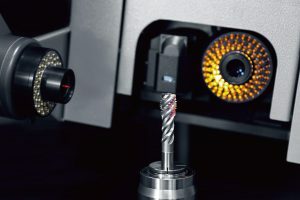 The hardness values offered by the gap-by-gap method are impressive, reaching 80-100 percent of the permanent roller hardness, and 80-85 percent of tooth base hardness, achieved by case hardening.Minimum module size for this method is usually 6mm, although 5mm can be hardened in exceptionally circumstances. 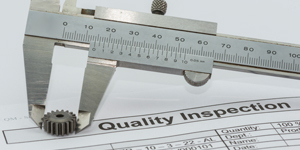 Whatever the module size, gap-by-gap hardening requires precision and expertise. Coupling distances between the teeth and the induction coils, for instance, can be as little as a few tenths of a millimeter. Thus today’s induction hardening systems come with electronic control systems and advanced coil-positioning technologies. But some distortion-minimizing strategies are surprisingly simple. Teeth can, for example, be hardened out of sequence instead of consecutively in order to prevent excessive heat concentration in specific zones. 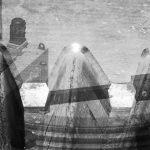 While predicting the future is ill-advised, it seems reasonable to say that wind turbines are destined to become an indispensable part of the world’s energy mix. 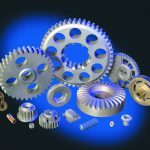 And as demand for gear rings and bearings increases, so will the need for more sophisticated induction hardening solutions. Consider, for instance, the challenge posed by the ever-increasing size of the main bearing used in today’s turbines. 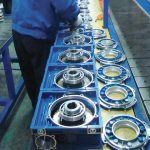 Such bearings typically have diameters of 2,000–3,000mm. But as wind turbines with power ratings in excess of 5 MW become more commonplace, so will main bearings with diameters above 4,500mm. 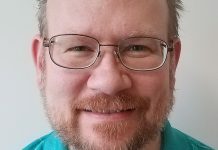 Only induction heating has the technical capabilities to meet such challenges — at least in a way that is financially feasible and capable of meeting stringent quality standards. 3. 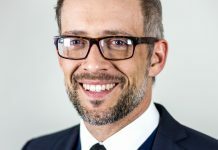 Weiss, T. “Zum Festigkeits- und Verzugverhalten von randschichtgehärten Zahnrädern”. Doctoral thesis, Technische Universität München (1983). 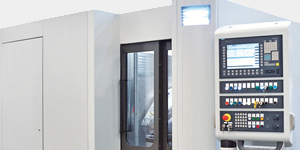 is the European sales director for hardening machines at EFD Induction. 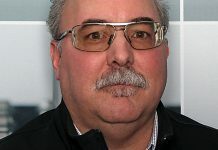 He is responsible for solutions and applications involving small, manually loaded machines to large, automatic turnkey hardening plants complete with component handling, washing, straightening and tempering capabilities. 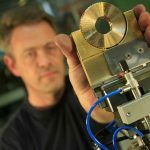 Among many responsibilities, he has specialised in ‘seamless’ induction heating systems for hardening the large rings and gears used in wind turbines. 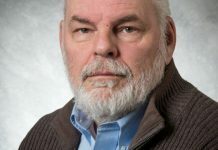 After graduating from the University of Duisburg-Essen, Schulte went on to work in a variety of technical companies before joining EFD Induction in 2008.